House bill would compensate Zion for storage of ‘stranded’ nuclear waste. U.S. Rep. Bob Dold, R-Ill., has introduced a bill that would compensate Zion and other communities that have served as storage facilities for nuclear waste. Exelon’s Zion Nuclear Power Station has housed about 1,020 metric tons of used nuclear fuel since it closed in 1998, according to a news release from Dold. In 2002, it was determined the fuel would be moved to the Yucca Mountain storage facility, which has not yet opened. Dold said Zion is one of 13 communities across the country storing nuclear fuel from a closed power plant. 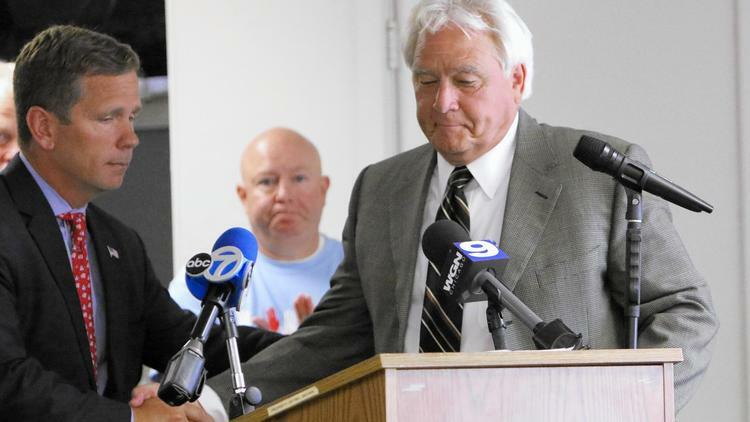 The Stranded Nuclear Waste Accountability Act would compensate Zion more than $15 million annually for seven years, an expiration date Dold said he hopes will push elected officials to find a long-term solution. 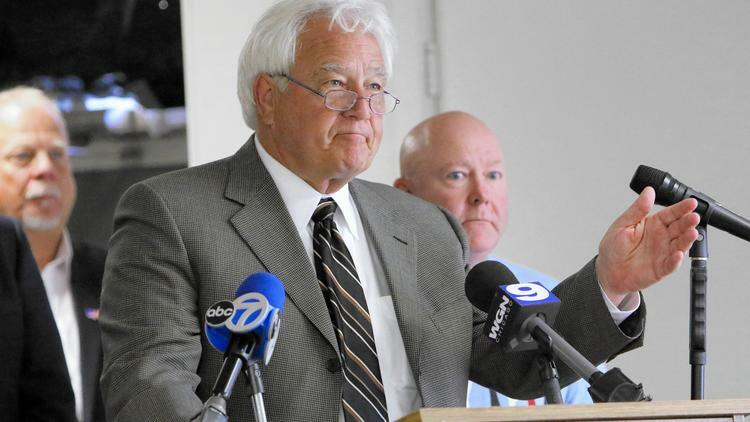 “We want to compensate these communities while it’s being stored here until we can again move it up to some other site,” Dold said as he discussed the bill with Zion Mayor Al Hill at the Zion Senior Center on Monday. Hill and representatives from the city’s taxing bodies called on the federal government in March to compensate the community for acting as a nuclear spent-fuel-rod storage facility. 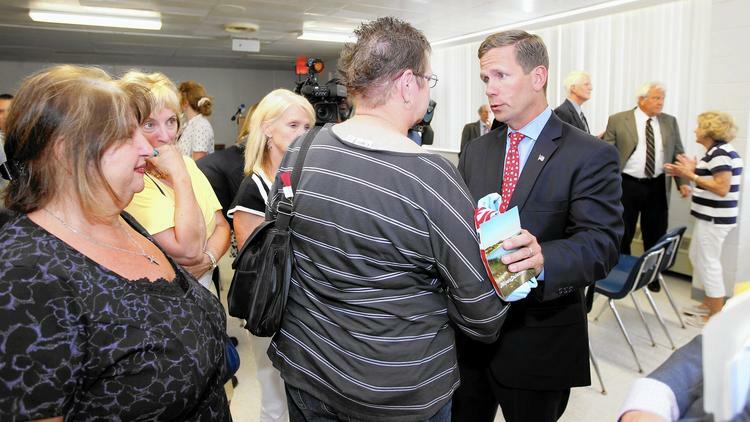 Dold said he and his staff then began working with them to formulate the legislation. Hill said he hopes to use the compensation to keep the city’s tax rate down. The plant’s closure resulted in an immediate loss of about 55 percent of Zion’s tax base, according to Nuclear Energy Information Service. Currently, the Zion School District 6 tax rate is 21.456 percent, and the Zion School District 3 tax rate is 18.050 percent, according to Zion Township Assessor Larry Wicketts. Both rates are the highest in the county. In 2014, a homeowner in District 6 would pay $9,331 on a $150,000 home in Zion. A homeowner in Lake Forest would pay $2,471 on a $150,000 home in that community, Wicketts said. “That’s what’s really killing Zion. It’s because of the high tax rate,” he said. Hill said the high taxes make bringing business in nearly impossible, and the federal compensation would not only allow city officials to keep taxes down, but also help convince companies to come to Zion and create a snowball effect for the local economy. “The theory is if we can lower the taxes, we can get more economic development, which would then lower the taxes more, which would then let us get more economic development,” Hill said. “Our taxes are higher, and what do we have to show for it?” Orawiec said. Winthrop Harbor resident Geneva Hughes, who also attended the event, said she thinks the legislation is a “brilliant” idea. For Zion Township Supervisor Cheri Neal, simply introducing legislation offers hope for the community that she says is going over a cliff because it can’t lower taxes and is seeing its residents leave. She added that the city is seeing a rise in low-income housing and students facing poverty. Paul Kakuris, president of the Illinois Dunesland Preservation Society, said he does not think the proposed legislation goes far enough. He said officials have “stars in their eyes” because the bill promises dollars, but it ignores the need to remove two pipes from the plant that extend hundreds of feet into Lake Michigan. The pipes are perpendicular to the waterfront, causing what Kakuris described as accelerated erosion of the shoreline. They will need to be removed eventually in order to protect the land along the lake and the species that inhabit it, he said. “They’re looking for those claims of dollars, but the pipes themselves have an economic impact because we either end up taking those pipes out public with public dollars or the nuclear industry and the (Nuclear Regulatory Commission) force them to take them out,” Kakuris said.